What happens when you mix the whimsical style of steampunk with sweet and savory flavors? You get The Toothsome Chocolate Emporium & Savory Feast Kitchen™ at Universal Orlando Resort™. Sitting along the Universal CityWalk™ skyline, between Universal's Islands of Adventure™ and the Hard Rock Cafe®, the massive eatery is best recognized by its steam-pumping, towering smokestacks. My wife, Ashley, and I passed through the revolving doors of Toothsome and entered a world of delectable delights. There was a lot of great food to try, but I knew the goal of this feasting footrace was to stuff my face full of Toothsome’s famous sundaes and milkshakes. We were ready to dive into dessert. 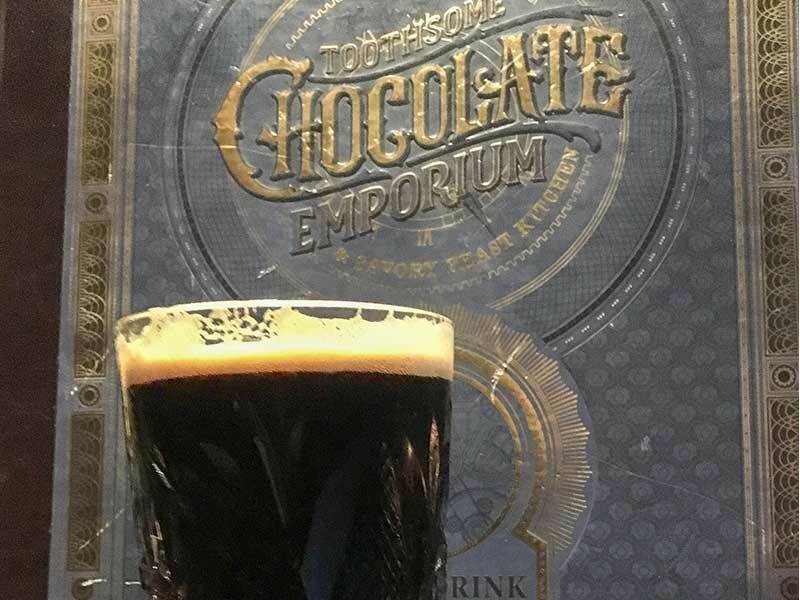 The steampunk vibe of Toothsome permeates the emporium with its Victorian style, brass accents, mechanical gears, and pipes running along the walls and ceilings while the smell of chocolate wafts through the air. Ashley and I were both amazed at the level of detail, realizing that this was no ordinary eatery. There are several ways to experience Toothsome. First, there’s the gift shop that sells t-shirts, coffee mugs, and other souvenirs, but also serves as a candy shop that’s filled with stacks of giant candy bars, caramel popcorn, and gourmet lollipops with bits of fruit embedded in the hard candy. For the more adventurous, there’s candyfloss stuffed into mason jars, and powdered and liquid candy poured into decorative apothecary bottles. 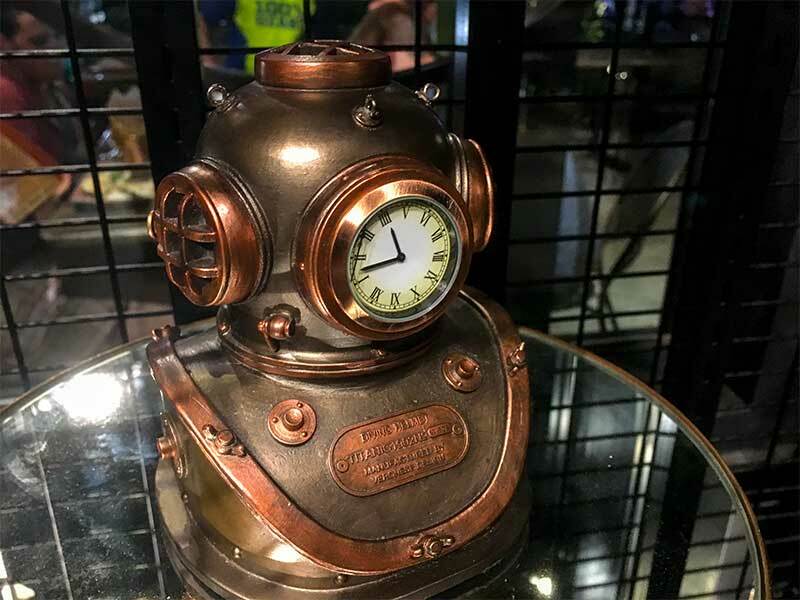 Experience the steampunk vibe of Toothsome. Behind glass counters, rows and rows of ornate chocolates and macaroons are laid out—some with unusual flavors like absinthe. The sight of it all would make a dentist cringe. 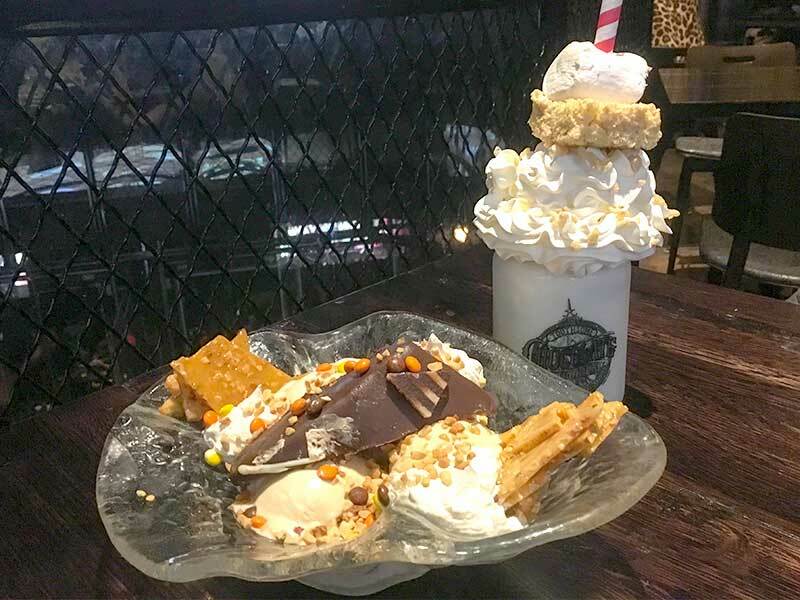 Another way to experience Toothsome on the go is the confectionary that makes their famous milkshakes and sundaes available. Finally, there’s the full-service dining area and bar with everything from crafty cocktails to savory entrees. We wanted the full experience, so we ascended the staircase with our bespectacled host to the second floor dining room. Along the walls, videos played showing the chocolate emporium floor, run by automated machines and robots no less, busily making candies. Once we were seated, we took a moment to look at the massive menu with its pages of cocktails, wines, temptations (appetizers), flatbreads, salads, soups, sandwiches, entrees, pastas, burgers, and, of course, dessert. Bringing balance to the sweetness of Toothsome is its extensive menu of savory fare, yet many of the foods it serves do have some element of sweet or chocolate to it. Bread that you would normally get for the table at an ordinary restaurant chain? That’s Chocolate Almond Bread and Lavosh here. And for the breakfast eaters that crave a little sweet, Toothsome offers an all-day brunch that includes items such as Chocolate Brioche S’Mores French Toast and Boston cream pie crêpes. Insulin not included. We skipped brunch and went straight to the libations. To drink, I started with the Too Chocolate Stout, a brew specially made for the restaurant. The rich, chocolaty stout had just the right amount of sweet to cut into the malt. Ashley had the Vanilla Chocolate Cocktail, a sweet mixture of Madagascar vanilla vodka, Trader Vick’s dark chocolate, Faretti chocolate, and chocolate bitters. It’s not dessert if it’s on the drink menu, right? We had a toast before we moved onto the Temptations. For Temptations (yep, we gave into it), we ordered two things that sounded really interesting to us: Totchos and Philly cheesesteak rolls. Our cheerful server soon came back and slid the piping-hot plates over. I caught Ashley’s eye through the rising steam as we both eyed the Totchos, a heaping mound of tater tots covered in bits of pork belly, green chile and an andouille sausage cheddar cheese sauce. It was the most indulgent thing I had ever eaten—that is, before I took a bite of the Philly cheesesteak roll. Truly, these strange spring rolls tasted just like a great Philly cheese. The Too Chocolate Stout is rich in chocolaty sweetness. After a bit of a break, our entrees came. I ordered the gnocchi with grilled chicken, sweet peppers, rapini, and mole cream sauce as I wanted something unique that also had a hint of chocolate (I’m in a chocolate emporium, after all). Ashley had the chicken bourguignon, a boneless breast with red wine demi-glaze, pearl onions, mushrooms, bacon, Yukon Gold mashed potatoes, and asparagus. Savory isn’t the first thing that comes to mind when you pass all of the chocolate at the front of Toothsome, but the food was fantastic. As we ate our meal, Professor Doctor Penelope Tibeaux-Tinker Toothsome (what a mouthful!) and her robot sidekick, Jacques, stopped by our table to see how we were doing. In the origin story of Toothsome Chocolate Emporium, Penelope opened the emporium as a way to share her love of chocolate with the world. The two struck up a conversation with us and I quickly took notice that, with a bit of wizardry, Jacques’ voice was modulated to sound just like a robot. To celebrate such a cool effect, I asked Ashley to take a photo with the friendly robot, who was more than happy to oblige. Our bellies were beginning to bulge at this point, but like my father always says, there are always a few cracks that need filling and there’s no better way to do that than with ice cream. A few cracks? Who were we kidding? This is what we’d been waiting for. I knew anything we ordered would be good, yet I studied the expansive dessert menu like its pages contained the secret for immortality (hint: it’s dessert). We ended up ordering the May Contain Nuts sundae and the Marshmallow Crisp milkshake. The sundae was, well, nuts. It had peanut butter ice cream, peanut brittle, peanut butter cups, a slice of chocolate peanut butter pie, whipped cream, peanut butter sauce, and was then covered in Reese’s Pieces. Delicious. We did our best before waving the white flag. As for the Marshmallow Crisp milkshake—an ode to Rice Krispies treats with its mixture of Rice Krispies, marshmallow fluff, and vanilla ice cream—we decided to take it with us since you get to keep the mason jar the milkshake comes with. The May Contain Nuts sundae and the Marshmallow Crisp milkshake. We took our shake outside, sitting on a nearby bench so that we could enjoy the Universal CityWalk™ nightlife. We took turns sipping on the shake as we enjoyed the cool evening. I looked back up at the smokestacks—still puffing away as chocolates were churned out. The slurping sound from the straw in the milkshake meant that our dessert had come to an end. In victory, I proudly held the mason jar over my head while my wife pretended not to know me. “Hey, we’re on vacation,” I said with a smile. For every kid that ever wanted to own a chocolate confectionary, this is a place where dreams come true. 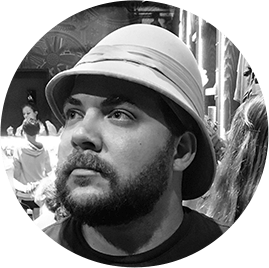 Stephen Kubiak Author and Florida Native An author and USAF combat veteran, Stephen Kubiak is a Florida native that works in the travel industry. When he's not creating social posts for the Sunshine State, he's teaching his sons how to properly wield a lightsaber. Find Stephen on Twitter and Instagram.